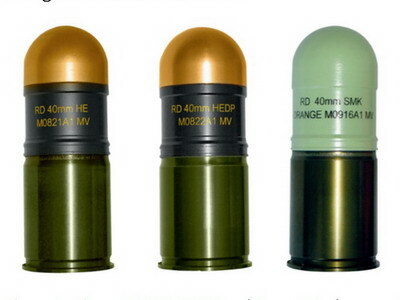 RDM 40 mm medium velocity grenades. Rheinmetall Denel Munition (RDM) is expanding its 40 mm grenade range, with airburst and self-destruct rounds being developed. RDM said that client requests for enhanced round safety spurred the development of self-destruct functionality in the 40 mm medium velocity (MV) fuse range. The self-destruct fuse will be introduced onto the market in 2020. Another new lineup to the medium velocity range is an electronic airburst fuse. These rounds can be programmed to detonate next to a target and are programmed in conjunction with a laser rangefinder. This allows targets hidden from line of sight to be engaged. The necessary optics and laser rangefinder can be retrofitted to existing grenade launchers. The airburst rounds will be introduced onto the market in 2021, with a couple of customers awaiting delivery of the rounds. These will join RDM’s existing medium velocity 40 mm round variants, which are High Explosive (HE), High Explosive Dual Purpose (HEDP), Target Marker, Practice Tracer, Practice, Smoke Red Phosphorous and Coloured Smoke. RDM’s range of 40 mm medium velocity ammunition was showcased during its Ammunition Capability Demonstration held between 18 and 21 March at the Denel Overberg Test Range in the southern Cape. 40×51 mm medium velocity ammunition fills the gap between low and high velocity 40 mm ammunition out to ranges of up to 800 metres. RDM pointed out that medium velocity ammunition has a flatter trajectory and better accuracy than standard 40 mm low velocity ammunition. In addition to producing ammunition, RDM also offers complete manufacturing plants and has provided several facilities worldwide.